The 500t capacity Liebherr, model BOS 14000-500D, is the main crane on the deck of Van Oord’s pipe-laying vessel, DLB Stingray. The prime focus for Stingray is S-lay pipe-lay work; when performing S-lay pipeline installation, joints of pipe are welded into a pipe string aboard the vessel. The crane required five-yearly testing. Anchor accepted a scope of work from Dormac Marine & Engineering to complete an overload test of the crane, constituting a 550t load being applied to the main hoist. Additionally, Anchor was required to complete a 55t load test of the auxiliary hoist as well as a 50t calibration test of the main hoist after the 550t overload test was complete. Two 75t capacity Radiolink plus load cells aboard the DLB Stingray. Four 75t capacity Radiolink plus wireless load cells and four 30t capacity wireless low headroom links, all manufactured by Straightpoint and sourced from Anchor stock, provided data to handheld devices throughout the project. Another four 120t load cells from a different manufacturer completed the force measurement fleet for the job. 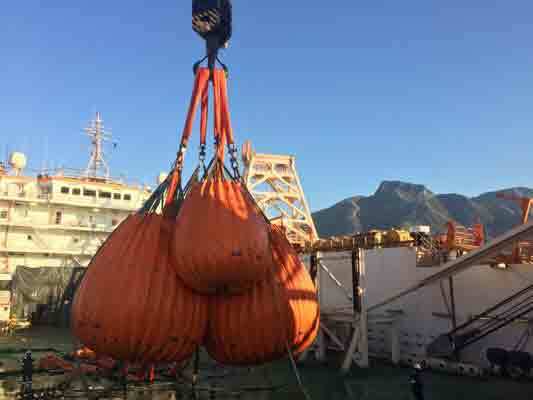 For the main overload test, a dozen water bags were used in a near-40m, three-tier cascading rig. At the top and middle were two 100t and two 40t bags, while three 20t and a 30t bag combined at the bottom. 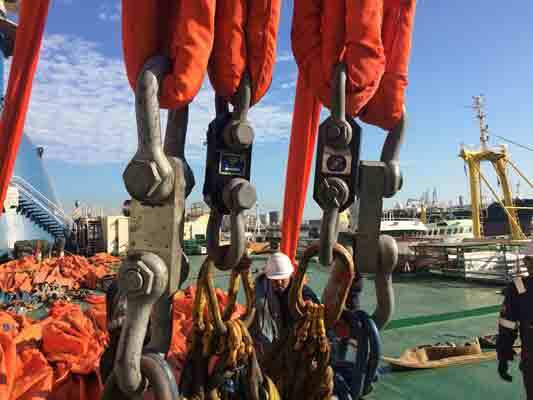 Supporting rigging equipment was allocated to each lifting point; for example, Point 2 for two 40t bags in Tier 1 included a 100t x 7m roundsling, two 55t safety bow shackles (above and below the 75t load cell), followed by the water bag. The Liebherr offshore onboard crane suspends Tier 1 of the cascading water bag rig. A dozen load cells and water bags were used for the project. The Radiolink plus is Straightpoint’s most popular product. The range of low headroom links, meanwhile, is designed to provide accurate measurement of loads in the most challenging applications where headroom restrictions are a major factor. In this case, Anchor wanted to limit the height of rigging in-between water bags. Constructed from high strength alloy steel and exposed to an array of testing during development, the tension load cells are designed to work with industry standard shackles. Further, said Tilley, they are lightweight and user-friendly. Anchor was aboard the vessel over a three-day period. Tilley explained that the first day was used for transportation of the equipment in two flatbed truckloads, then rigging up the water bags. Day two saw completion of the 550t load test, while the two additional tests, rigging down and offloading took place on the final day. Tilley concluded: “The job was well planned and executed within the timeframe without any significant challenges other than the short lead time; we received confirmation of the job on the 17th of the month and delivered from the 20th to 23rd. We used handheld devices for this project but have recently acquired Straightpoint’s multi-load cell reading software [SW-MWLC] and look forward to applying it on future applications of this nature.” The Liebherr boasts the Litronic crane management system, a one-level interface between crane and driver. Various analysis tools provide relevant information on the operation and the system empowers the driver to efficiently control the crane and optimise turnover. Stingray, meanwhile, has a design draft of 5m and dimensions of 120m by 40m.